Halloween is almost here! What better way to wish someone a happy Halloween than with this cute footprint card? The original idea I saw showed doing this on a plate. While that's cute and all, I wasn't sure what my recipients would do with a bajillion plates and platters with my daughter's hand and footprints--because, let's be serious, I will be making a ton of these kinds of things. They're just too darn cute! Plus plates and things get expensive, so there's that. I decided a card was the best way to go for this project. Put your little one's footprints on the front. This is best done with help, as those little toes do not like to hold still! When the paint has dried, use a regular Sharpie to draw on the hat, and a fine-point Sharpie to draw the face and hair. Don't worry if you're not an artist, it doesn't have to be perfect--people will be looking at your little one's darling footprints, anyway. 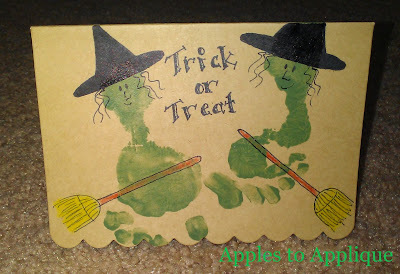 Outline a simple broom shape with the fine-point Sharpie and then color it in with colored pencil or crayon. Write "Trick or Treat" on the outside and "Smell my Feet" on the inside. 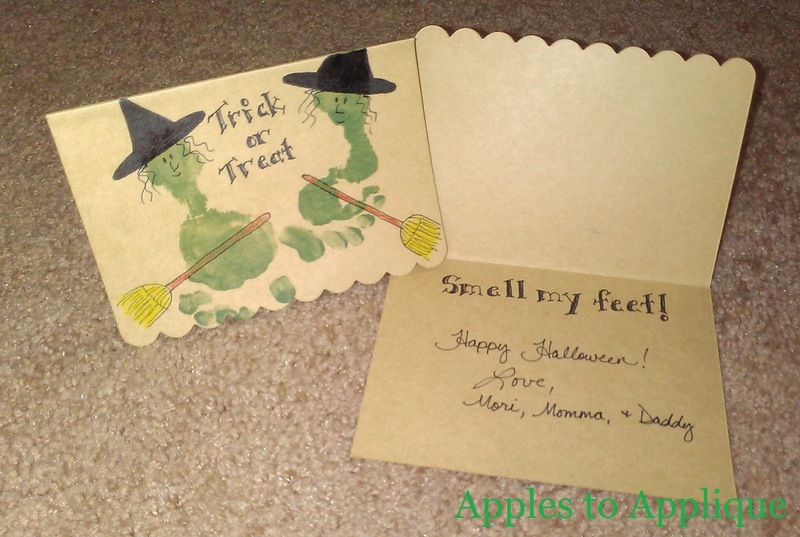 Add in your own personalized greeting and you're ready to send off your card! Grandmas, grandpas, aunts, and uncles will love getting this greeting in the mail!